Was a very busy weekend and I didn’t have much time for crafting, cooking or creativity of any sort. There was a sleepover, a dance performance and my 6 yr wedding anniversary. 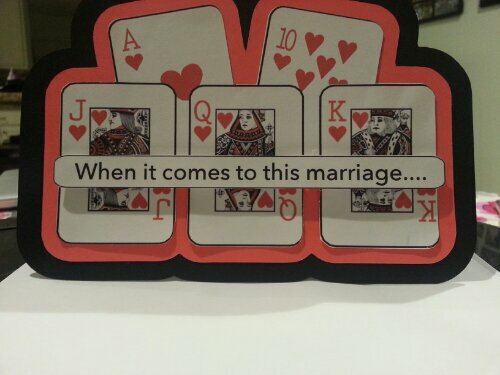 I made my husband a poker themed card, which I promise to post a pic of tomorrow. Right now I’m headed to bed. Nite ya’ll! It’s been rainy and windy outside all day today and it’s supposed to keep raining for a while; they are even saying there is a chance of flooding. If that happens I sure hope they cancel school BEFORE I get there instead of after I’m already there. The weather has been dreary for days, don’t get me wrong I like rain. I like the smell of it, the sound it makes when it lands on something, even how it feels when I’m running through it, (yes I still go outside and play in the rain if there’s no lightning) but I don’t think we’ve seen the Sun for like 5 days and I’m starting to kinda miss it. The original recipe calls for making a dark roux (20-25) minutes, sautéing the veggies and andouille sausage in the roux and then adding chicken stock and boiling for 1 hour. After that you add boneless chicken meat and cook another 2 hours. I LOVE, LOVE, LOVE to cook and pride myself on cooking dang near everything from scratch, but after working all day, taking one kid to the dr and then swinging by the vets office for stitches removal, the last thing I felt like doing when I got home was cooking for almost 4 hours. We wouldn’t have eaten until like 8 o’clock. So I shortened the times by not making the roux quite as dark as I should have and using a rotisserie chicken. Sacrilege!! I know. But a mom’s gotta do what a mom’s gotta do. I will come to my own defense and say that I have made this gumbo numerous times (once the power went out right when I was adding the andouille and I kept on cooking, albeit by candle light) and this tastes 95% as good as the original. I may even use this shortcut more often. Shhh don’t tell my husband, he isn’t home yet and I wonder if he will be able to tell the difference. He won’t mind; I’m just curious. 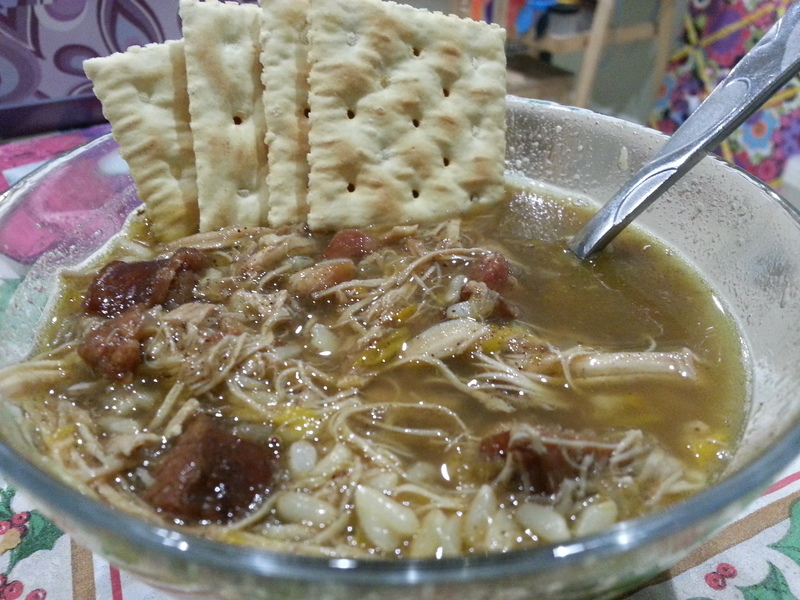 The full recipe that I normally use can be found by going to http://www.foodnetwork.com/recipes/emeril-lagasse/chicken-and-smoked-sausage-gumbo-recipe/index.html. P.S. I used Brown Minute Rice too! At 8:32 a.m. my eyes opened while the rest of me was screaming “Please no, don’t get up yet!!! There’s still time left for sleeping.” Alas no, it was too late, I had already seen the light. So of course I did the first thing most people do between the ages of 12 and dead…looked at my cell phone to see what I had missed out on in the middle of the night (come on you know you do it too). Much to my surprise I saw that my little blog had received 2 comments and 9 or so views. Now I’m thinking at least 5 of those were me looking at my own blog trying to decide if I liked what I had started or if there were changes that needed to be made. I’m still not sure about the theme I chose, don’t get me wrong, I like it an all, but I liked so many of them. If you could have been next to me while I was choosing one you would have thought I had multiple personalities and they were arguing inside my head. I think I tried just about every free theme WordPress had to offer, but ultimately went back to this one because it was pretty. LOL! I’m a girl and I like pretty. Sue me. So after checking my phone and completing all the other morning tasks one does I trudged out to the kitchen. I started up my computer, made some coffee, then sat down to see how my little blog was doing and to approve the comments. It felt so official. I’m sure in time if I should suddenly become all-the-rage it will be annoying to have to approve every comment and maybe there is a way to turn it off that I’m not aware of. Any takers out there wanna help me out? Once I had the oh so time consuming task of approving the comments I decided to work on a little card that I had been mulling over in my brain for a few days. The inspiration for the card came from a YouTube video I had watched after we first got our Silhouette Cameo and I was trying to learn how to work it. The video was done by Chris416ward and she made an owl shaped happy birthday card. I thought it was cute so I created my own version using what I had at my disposal. 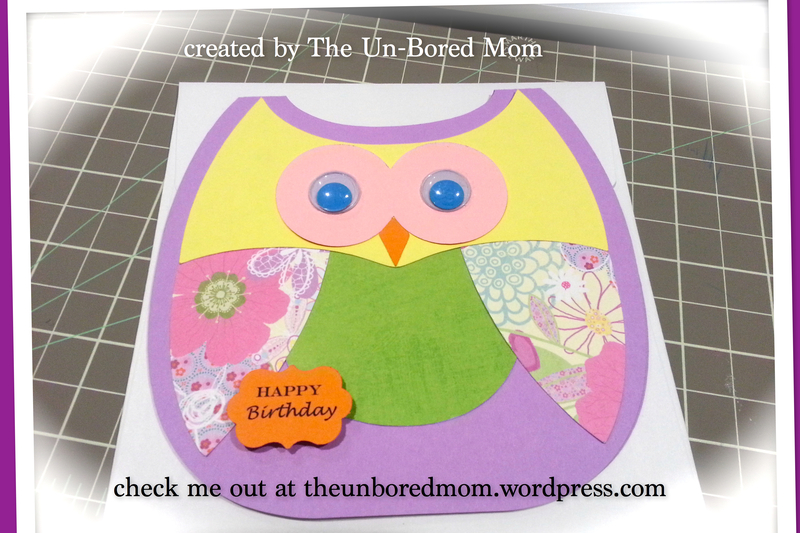 I used our Cameo to cut out the owl parts and make the card base. For the sentiment on the front I used the same punch used for the inspirational owl card, but I used the print and cut feature of the Cameo to add the words. 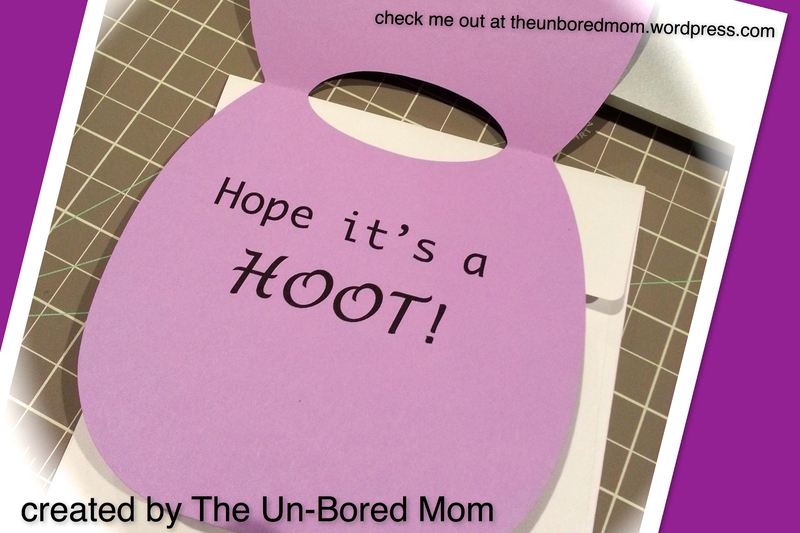 Also used the print and cut feature of the Cameo to add the “Hope its a HOOT!” to the inside of the card, although I think it’s supposed to be “WHOOT!” Oh well too late now. Again I have no one in particular to give it to, but I had time on my hands before my youngest, Liliana came back from her sleepover at Gma’s and the oldest, Alexandria (Alex or Kat or Al or Zandria…or whatever she wants to change it to this week), woke up. She’s a teenager, they tend to sleep in. I can’t think of anything else. Enjoy! Tomorrow I go back to work so I really need to go to bed now and wouldn’t you know it my eyes are the ones screaming this time. Go figure…LOL! I created this simple “Thanks” card the other night after my youngest had gone to bed. Currently I’m on winter break from my teaching job so I have a bit more time on my hands to do some crafting. I don’t exactly have someone to send it to at the moment, but I didn’t want to let the idea get away from me. My very first blog posting ever…. So I was inspired to start a blog after doing a web search for other blogs and finding so many great people out there with great ideas for foods, crafts, DIY projects and people who just wrote about life from their point of view. 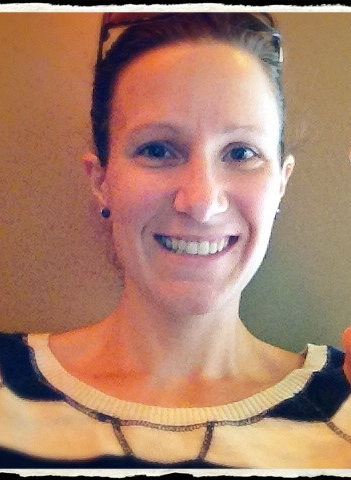 Allow me to introduce myself…my name is Lyndsey. I’m 34, married just about 6 year with 2 daughters, 5 and 17, and a full-time teaching job. I don’t have a lot of spare time to devote to hobbies and other interests, but when I get a chance to create something I think it could be fun to share it with others. Who knows I might inspire someone else to create something great! What is this blog going to be all about…anything I want it to be, it is mine after all. Some days I might post a recipe that I tried out or created myself and other days I might post a project am I working on, like a card I made or a DIY project. Perhaps I will stumble across something interesting on the internet or have a truly inspiring thought I want to share. Maybe I’ll take a great vacation or learn a new skill. Who knows?